Everyone’s favorite wise-cracking, dumpling-snacking hero is back in Kung Fu Panda 3! You’re going to want to add this family-friendly flick to your summer watch list. Mother’s Day Movie Night Blog APP & The Best Of WB 100 Film Collection #GIVEAWAY! Nothing says “I Love You” on Mother’s Day like a classic movie night made for mom! Warner Bros has created a huge collection of their most beloved films including titles such as “The Goonies” and “Batman.” It is sure to not only provide entertainment for the whole entire family but also put a huge smile on any mother’s face this upcoming holiday. To celebrate the release, Warner Bros has come out with an interactive blog app for fans. Check out the app below and enter for your chance to win the complete film collection! 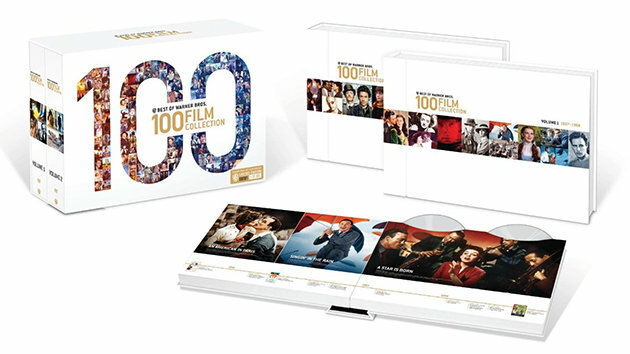 The Best of WB 100 Film Collection includes 100 movies including all 22 of Warner Bros. Library’s Best Picture™ winners on 55 discs presented in book style premium packaging. Plus two all-new documentaries: Tales from the Warner Bros. Lot and The Warner Bros. Lot Tour. With hours of commentaries, behind-the-scenes featurettes and more on select films. Also includes a limited edition 27” x 40” poster, plus a postcard series of Warner Bros. movie posters designed by legendary Bill Gold. Guess-the-Scene Game! How well do you know the silver screen’s most famous love stories and sing-a-longs? Play the Guess-the-Scene game to test your knowledge on the world’s greatest films! The quicker you pick, the more points you score. Ready? Action! Words in Film! Select your mood and let quotes and images from film express how you’re feeling! Movie Night Conversation Starters! Watching a classic flick together is the perfect opportunity to catch up and share stories… this Mother’s Day make it a point to connect with your family and give them a chance to learn something about mom they never knew! Partners Hub and Warner Bros have generously provided Young At Heart Mommy readers with the opportunity to win The Best of WB 100 Film Collection! This would make an awesome Mother’s Day gift and would put the cherry on top of any movie night. To enter, use the rafflecopter form below. Disclosure: The materials provided for this post were supplied by Warner Bros and Partners Hub. I am not being compensated and all opinions are my own! Return to Nim’s Island Family Adventures Blog App & Blu-ray Combo Pack GIVEAWAY! Ho Ho Ho, it’s the holiday season and that can only mean one thing… Shopping! But finding presents for your loved ones can be no easy task! That’s why Warner Bros. has come up with their awesome Happy Holidays Blog App featuring some classic and new movies out on Blu-ray sure to please everyone from your teeny nephew to grandma wrinkles! Do you enjoy watching movies to get into the holiday spirit with your family? Enter below and you could be the lucky winner of one of the following Warner Bro’s Blu-ray movies: Peanuts Deluxe Holiday Collection, Classic Christmas Favorites or Dr. Seuss’s Deluxe Holiday Collection. This giveaway requires a quick turn around. Winner must submit shipping information by December 20th! Disclosure: I am working with Warner Bros and they are providing me with the materials for this post and giveaway. I am under no obligation to post a positive review on them. I will not be compensated for this post. As always, opinion are my own!